Random factoid: St Valentine is also the patron saint of beekeepers and epilepsy. He is called on to not only watch over the lives of lovers but also for help regarding beekeeping. epilepsy, the plague, fainting and traveling. As expected he is the patron saint of engaged couples and happy marriages. Oh, and I made simple vegan cupcakes. I am not what you would call a romantic person. I am not a fan of grand gestures – thank goodness the husband proposed in a car – and I don’t really like fanfare. Honestly. if you do the dishes after dinner and hang out the washing once in a while my heart is pretty much yours for life. I like simple. Few things turn me to putty like the sight of the husband playing dress up with my daughter even when I know he’s tired or older couples on the street who still hold hands…that kills me. Make my coffee in the morning before you leave for work and I’ll love you for days. Simple. Our “we” is a “three” so it seemed fitting to make my daughter’s favourite cupcakes on this the day of love. I am quietly confident they are the husband’s favourite too. These vegan vanilla cupcakes are how I like my romance. Simple. 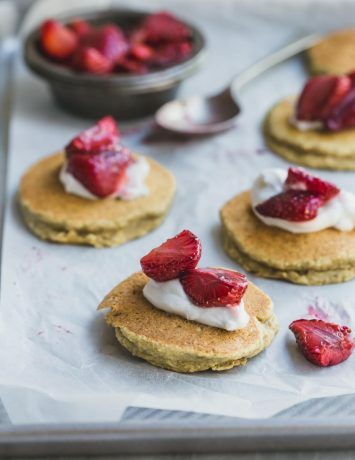 Adapted from a vanilla and strawberry cake I created for my cookbook, these little morsels are super easy to make emerging from the oven light, moist and delicious. With no creaming of butters or sifting of flours these cakes are simply mixed, baked and enjoyed. I made a version for my little one’s 5th birthday and no could guess at the vegan-ness hiding within. 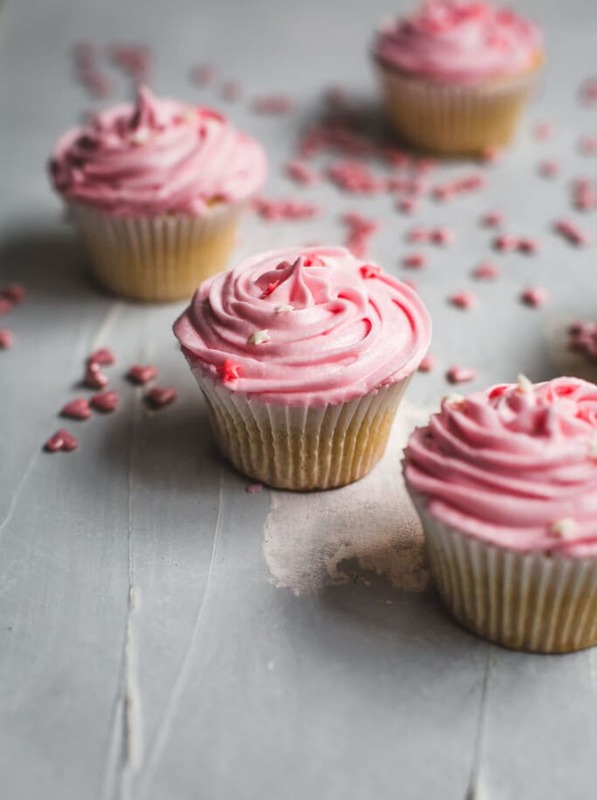 While I opted for a whimsical and romantic pink buttercream frosting, the recipe (adapted from Alison’s simple recipe at Loving It Vegan) can be tweaked to your taste. I love Alison’s recipe because, while it is a buttercream frosting, it isn’t loaded with butter. 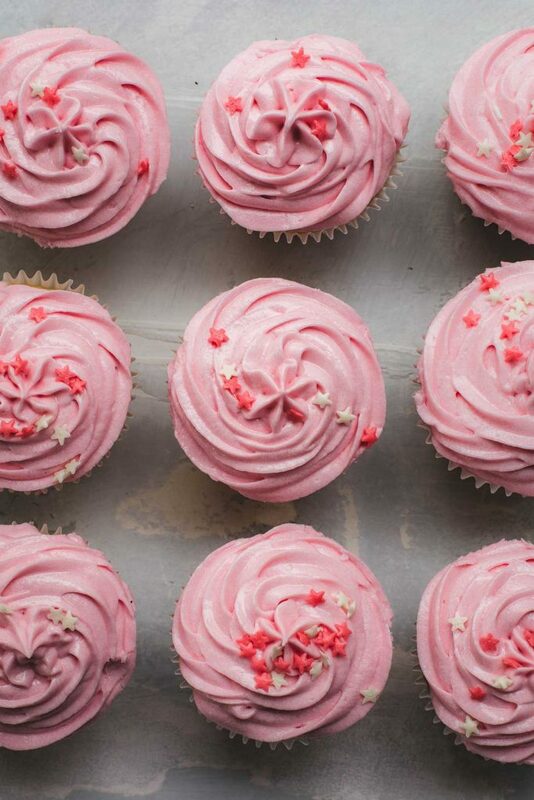 Perhaps it’s just me but I find the butter ratio in many buttercream recipes too…er, buttery. It’s a tongue-coaty-texture-thing. Using the recipe as a base you could sub out the vanilla for a coffee, mint or any extract you like. My advice with other flavours however, is to start small and add. I imagine a teaspoon of peppermint extract might knock you off your rocker. I could be wrong; let me know if you try it and your rocker remains intact. 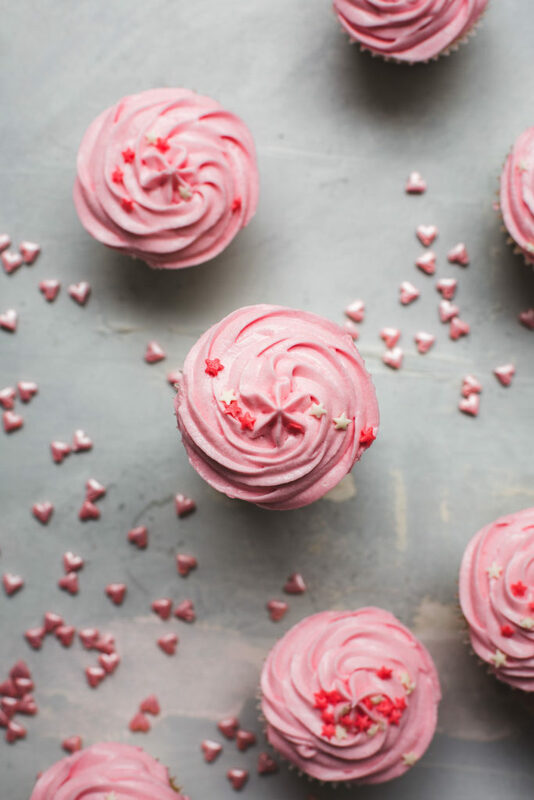 Whether your celebrating love, birthdays or beekeeping these simple vegan vanilla cupcakes are a sure way to any sweet-toothed heart. Even a romance grinch like me is smitten with them. Enjoy. 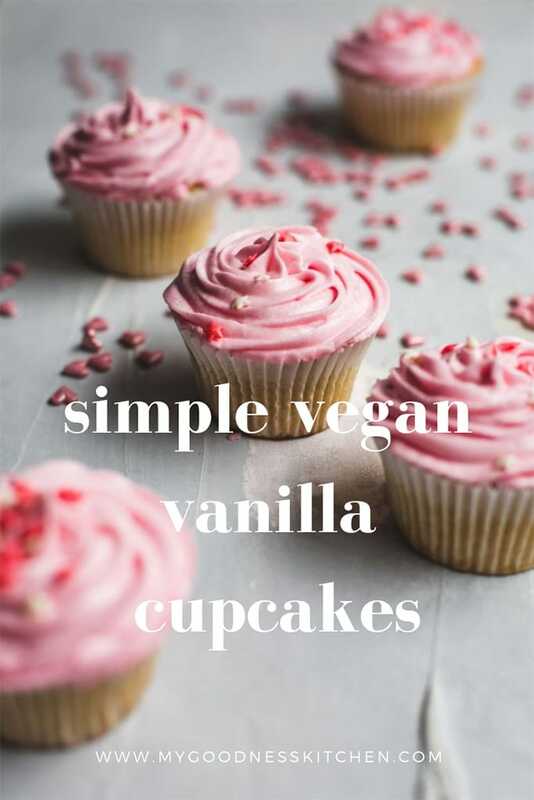 If you try these vegan vanilla cupcakes, please let me know! Leave a comment, rate it, and don’t forget to tag a photo #mygoodnesskitchen on Instagram. I’d love to see what you come up with. Cheers, friends. 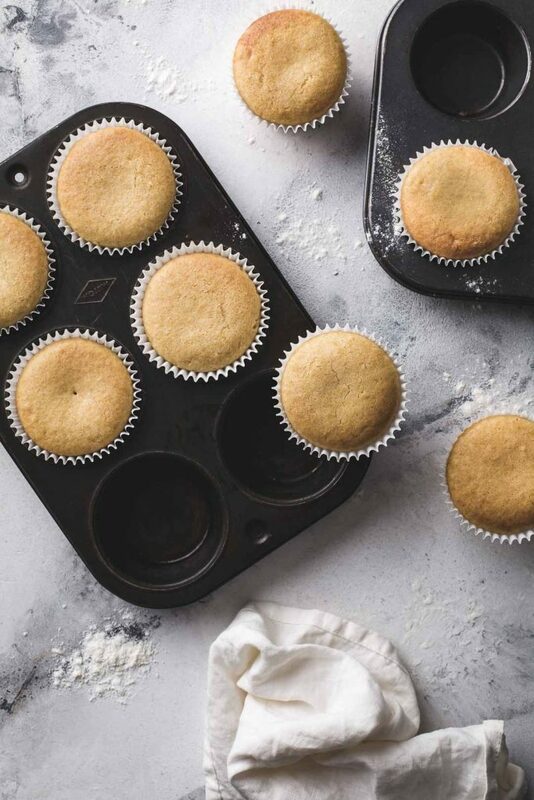 These vegan vanilla cupcakes could not be easier to make with no creaming of butters or sifting. Simply mix together and bake. Preheat oven to 170 degrees C (340 F). In a large mixing bowl, stir together the flour, baking powder and salt. 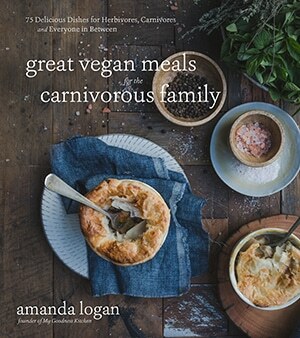 In a separate bowl, whisk together the raw sugar, sunflower oil, apple sauce, dairy-free milk and vanilla extract. Add the wet mixture to the dry and gently whisk until smooth - a few lumps are fine. Better a few lumps than to over-mix the batter. Line a 12 pan cupcake tray with cupcake paper cups and spoon the batter in to each about 2/3 of the way up. I transfer my batter to a jug and pour them from there for less mess. Pop the cakes in to the oven and bake for 17 - 20 minutes or until a skewer comes out clean from the centre of a cake. Remove from the oven and after 10 minutes remove the cakes from the pan and allow them to cool completely. Add the confectioner's (icing) sugar, vegan butter, vanilla and salt to a large bowl and using a hand mixer, beat on low for around 2 minutes or until combined but lumpy. Add the food colour (if using) and one tablespoon at a time beat in the soy milk until you have your desired consistency. 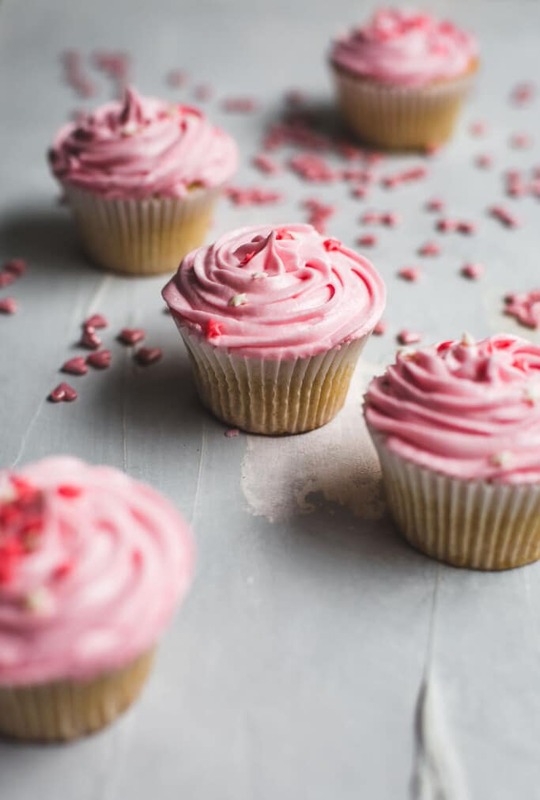 Transfer the frosting to a piping bag (or a large zip lock bag with a corner snipped and a frosting nozzle fitted) and pipe on to the cake once they are completely cooled. Serve immediately or store, covered, in the fridge for 3 days.